Part of being a responsible puppy or dog owner is knowing when to call the vet. So many people let things go and have a “wait and see” attitude when their pet has something wrong. Sometimes, “wait and see” is fine, other times it can be the difference between life and death. With many things, the sooner caught, the more effective and even less expensive treatment can be. Younger dogs, older dogs or dogs with a condition that can affect how it responds to illness can succumb faster than a young, healthy dog. Age and overall health play a factor in how a dog will respond to an illness, accident, etc. Your vet should be you first ally when concerning the health of your dog. Try to use a vet willing to work with you and who seems generally concerned about your pets. Just like with human doctors, there are vets who are very dedicated to their profession and others who are not. 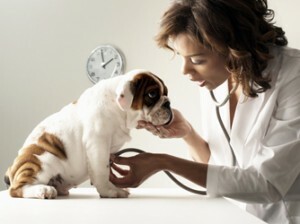 Having a good relationship with your vet is a key element in the health and maintenance of your dog. If for some reason I have to leave a clinic my pets are seen at (like when my family moved), I will think nothing of interviewing various clinics to ensure my pets will find someone as caring as the people we had to leave. With the Internet as popular as it is, many people go there for information before the vet. Though the person may get advice, it may be totally incorrect. Many conditions have similar symptoms. What if someone says their dog had the same symptoms and was fine in a couple days but your dog’s symptoms are of something potentially deadly? Even vets on line cannot see your dog to examine, runs tests, etc. These are vital in proper diagnosis. Relying solely on information from message board posts, etc., is not the best way to find out what is wrong with your dog. * Always call your vet should you think or know a car has hit your pet. Even if you do not think the wheels touched him, get him in! If your vet is not open, find the closest emergency vet clinic. * Always call your vet should you suspect your dog has eaten a toxin. Things like antifreeze can kill in tiny amounts. Onions, chocolate, alcohol and many plants are toxic in varying amounts. Tylenol (acetaminophen) and Ibuprofen can be deadly, as can other human medicines. * Always call your vet if you suspect your dog has had a seizure. * Always call your vet should you suspect your dog has swallowed a foreign body. * Sudden weight gain or loss should be alerted to your vet. * Sudden shifts in temperament – like going from normally very sweet to aggressive – can be a sign of problems, even medical. * Should you find any lumps or bumps when examining your dog (you should examine your dog weekly when your groom) call the vet. * If your dog has been off food, water or acting lethargic for twenty-four hours or more, call the vet. A young puppy or senior dog should be called in sooner. Though one missed meal may not be an emergency – look for other signs of illness. * Should your dog be vomiting or have abdominal tenderness or swelling, call the vet. * Should you notice lameness and limping -whether or not there was an injury. If you notice lameness when getting up, stiffness in moving, etc., call. * Ask your vet about the signs of bloat. Large and giant breeds are more prone, but it can happen to any dog. Indicators of bloat are abdominal swelling and discomfort. If allowed to go on even for a few hours can be deadly. * Diarrhea for more than twenty-four hours or diarrhea with blood should be an alert to call the vet. * Rashes, falling out fur, excessive shedding or chewing at spots on the body should be brought to your vet’s attention. * Should the eyes look hazy or your dog seem to have trouble seeing or there is an abnormal discharge from the eye, call the vet. * Bad breath and yellow teeth indicate dental issues – though not an emergency should be addressed. However, if the breath smells sweet, there could be other problems. Pale gums can be signs of a serious problem. * Bad odors, discharge and crud in the ear could signal a problem. * Anything that seems out of the ordinary for your dog should be cause for concern. * Know your dog and all his normal habits. In my book, it is better to get the animal in and spend the money to find out nothing is seriously wrong than to let sometime go for days and turn into something very serious. Fast acting is often the key in fast recoveries.